“Tastes like chicken” is not usually a compliment. But this dish tastes like chicken should—moist, buttery, and rich—and still cooks with all the convenience you expect from boneless breasts. The secret? Pan-fry them with plenty of butter. After browning both sides, add a cup of stock or water and simmer this goodness, uncovered, until most of the liquid evaporates and your instant-read thermometer says >165°F. Put the chix on a plate, add a little more butter to the pan—maybe a squeeze of lemon—and stir it up for a rich pan sauce ready for drizzling over the chicken. Forget chicken. This tastes like heaven. Chops are the original fast food. Faster than driving thru the golden arches? See for yourself. Add olive oil (or bacon fat) to a hot cast iron skillet—or whatever pan is handy—and fry for a couple of minutes on each side, longer if your chops are thick. Shoot for about 145°F on your instant-read thermometer. Garnish with a dollop of sour cream and a couple of thin slices of apple, or onions caramelized in the pan drippings. And no one is going to ask you if you want fries with that. Where’s the beef? It’s on your plate, and it’s simple and delicious. 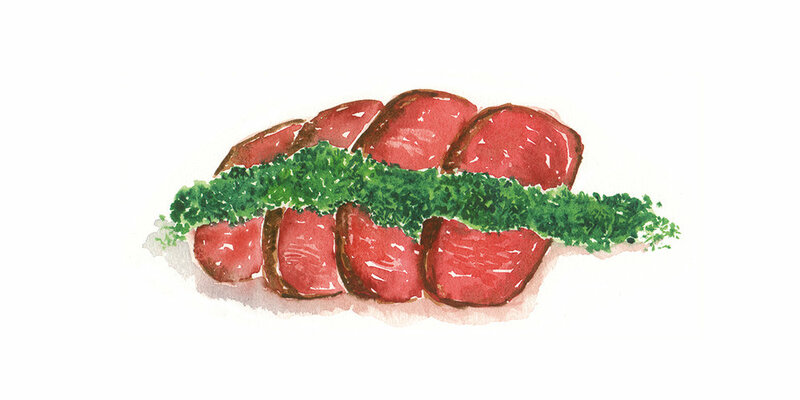 Season a room-temperature steak and grill to about 5°F below the “doneness” you’re going for. It will continue to cook a little after you take it off the grill. Use your instant-read thermometer to save yourself the agony of turning an expensive cut of meat into shoe leather. For extra flavor, top with butter: herbed butter, beer butter, chipotle butter, plain butter. On steak, any butter is good butter. Next time you want to punch someone, take your aggressions out on dinner. Pummel boneless chicken thighs between parchment paper, until they’re about 1⁄2” thick­—the thinner they are, the better you’ll feel and the faster they’ll cook. Pan-fry in plenty of melted butter over medium heat, about 5 minutes per side, but double check to see that they are done; look for165°F on your instant-read thermometer. Add some flavor with a couple drops of lime juice, fresh herbs of any sort, or a dollop of sour cream, mayo, salad dressing, salsa, or chutney. Serve with a wicked grin. Burgers in their birthday suits? Skip the buns and accessorize with actual food instead. Pat your ground beef into 5-6oz burgers, about 1” thick. Season on the outside; no need to mix it in. Grill ‘em up or pan-fry in a little butter over medium heat. Some like burgers rare, but the USDA suggests you play it safe and go for 160°F on your instant-read thermometer. Dress your patties in cheese, pickles, avocado, tomatoes, and bacon. Try a fried egg if you’re feeling frisky. Getting naked never tasted so good. Flank steak. Skirt steak. Hanger steak. Big on flavor, small on price, these cuts need a little extra love to keep things from getting chewy. Start with an hour or so in our marinade. You’ll likely grill these for 5-10 minutes per side, but your instant-read thermometer knows best. We can say this much: Take them off the heat about 5°F before you think you should. Take another 5 minutes and let the beef rest before slicing at an angle, across the grain. Top with our chimichurri, open a jar of roasted tomatillo salsa, or drizzle with soy sauce and sesame oil. Love meat tender. Pork’s reputation as “the other (dry, tasteless) white meat” is banished forever, the vintage way. Marinate a pork tenderloin overnight, or for 20 minutes on the counter—go bold with the flavors of your choice. Pour off the marinade, coat with olive oil, and roast at 375°F until your instant-read thermometer says 145°F (higher if you like your pork well done). While the tenderloin rests (about 10 minutes), whip up our easy gravy from the pan juices. Any way you slice it, it’s delicious. Turkey doesn’t have to go into hiding after major holidays. It’s a great way to feed a crowd. Or buy just the breast and feed a smaller crowd. Start by pressing some butter under the skin and seasoning the bird. There are soooo many ways to roast/smoke/grill. Either use your tried-and-true, favorite method, or try something new you find online. Just don’t forget to make a lot of gravy. You won’t be sorry. You can put it on your veggies, too. Just saying. Old school satisfaction without much work. Prep is easy. Coat with olive oil, slap on some seasoning, and shove it in the oven. Roast for about 20 minutes per (boneless) pound. Use your instant-read thermometer, and pull it out about 5°F before it reaches the temperature you seek. (See chart on page 17. We like it medium-rare, and shoot for 125°F.) The tricky part? Rest. You need it. So does a roast. The roast sits on the counter for about 20 minutes. You might prefer a couch. 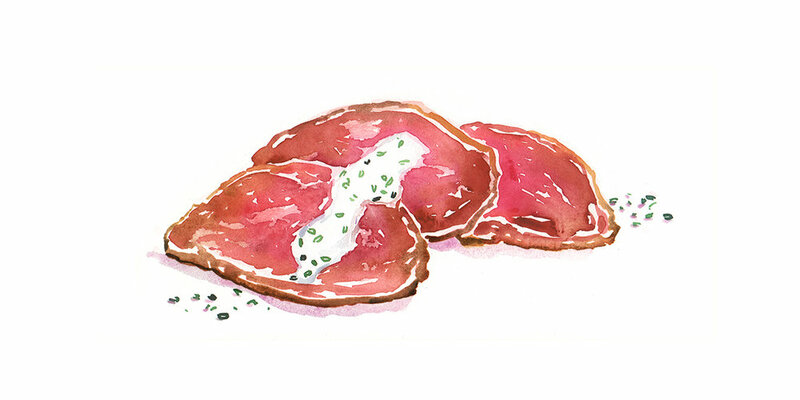 Whip up a creamy horseradish sauce before putting your feet up to enjoy the smells, knowing you and the roast are still cooking. Ancient kitchen wisdom: small pieces = cooks quickly. Cut up—or snip up with kitchen scissors­—raw chicken (breasts or thighs) into bite-sized chunks. Sauté in peanut oil over medium heat, using a spatula to flip the pieces every couple of minutes. They’ll be ready before you know it, 10 minutes max, but check the biggest chunks with your instant-read thermometer. 165°F is the magic number. Once you get there, stop cooking and start sprinkling: sesame oil, a little soy sauce, toasted sesame seeds, red pepper flakes for Asian flavors. Garlic, herbs, cayenne, and salt for something else just as tasty. Bruce Lee fast but without the toughness. The secret to stir-fry tenderness is a quality cut—sirloin or similar—sliced across the grain into bite-size strips. Marinate for whatever time you’ve got, hours, minutes, or not at all. Sauté in peanut oil over medium-high heat until barely done, maybe 2 minutes per side. The USDA says shoot for an IT of 145°F, but we get them off the heat sooner rather than later; they’ll cook a little more as you season them. Drizzle with soy sauce, top with chopped parsley and crushed peanuts, and add some crushed red pepper for an extra kick. Don’t feel sheepish about breaking out the lamb chops when you want an easy, elegant treat. 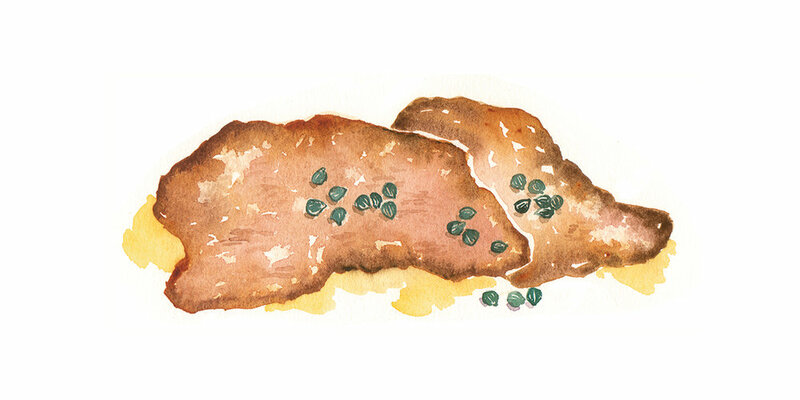 Marinate chops for a few hours if you can—or skip this if you’re in a hurry. Season your chops with salt and pepper and pan-fry over medium heat in a cast iron skillet coated with a little olive oil—grilling works too—for about 5-10 minutes per side. Use your instant-read thermometer and take them off the heat a little early. While the little lambs rest a wee bit, add some butter and mustard to the frying pan for a simple pan sauce. Skip the green jelly and add a sprig of fresh mint. Kebabs are quick and fun, like little meat lollipops, and a nice change from the same-old, same-old. Start with ground lamb in a bowl. For a pound of meat, you’ll need a tablespoon each of cumin, paprika, and chili powder, plus a teaspoon each of salt and pepper. (Your own favorite spice blend works too.) Form the meat around skewers; shoot for 5 skewers per pound of meat. Pro tip: square them off for easy cooking. Pan-fry the kebabs in a little olive oil, turning often and getting all four sides. Remove from heat when internal temp hits 160°F. Spoon on some tzatziki, which is easier to make than it is to spell, and even easier to buy, if your market carries it. Forget the wiener and the schnitzel. Veal cutlets are delicious, super quick, and a lot less messy without the breading. Cover them with parchment paper and work out any anger issues by pounding them to about 1⁄4-inch thick. Very therapeutic. Pan-fry in butter over medium heat; a couple of minutes per side will do. Remove the cutlets and add more butter to the pan. Allow it to brown, mixing in parsley and capers and maybe a squeeze of lemon juice. Drizzle the sauce over the veal, and don’t be shy with the salt and pepper. Serve with calm and a (relatively) clean kitchen. 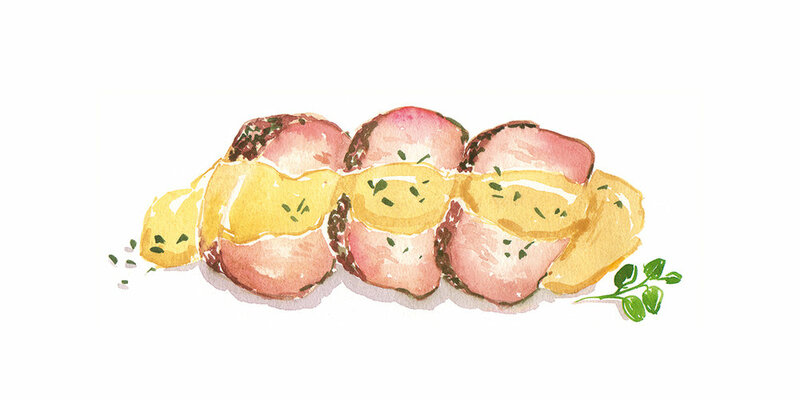 More ham than bacon, it’s aboot time you made this conveniently packaged meaty treat from our neighbors to the north. Use a large skillet to pan-fry slices in butter over medium heat until brown around the edges on both sides. Serve them up with a yummy Dijon mustard-mayo combo. Or homemade aioli. Anyway you top ‘em, they’re a beauty, eh? Kielbasa. Brats. Chorizo. Even hot dogs (gasp!). A sausage by any other name is still a crazy convenient way to get dinner on the table. You can even start with a precooked link and save yourself all kinds of time. We’re going precooked Italian here (hot or mild is up to you). Slice at an angle, and sauté over medium heat for about 5 minutes, maybe longer if you like more char. Try to get the cut surface browned on both sides. That’s it. Skip the bun, because you’ve got sour cream—or any other favorite rich creamy thing—for dipping. We’ve all heard the song. “On top of spaghetti” is no place for meatballs. They’ll be safer in a luscious pool of rich creamy tomato sauce. Mix ground turkey in a bowl with one egg and about 1⁄3 cup shredded parmesan cheese per pound of meat, plus some salt, pepper, and Italian herbs. Make the mixture into golf ball-sized spheroids. Sauté in olive oil, turning, until brown on all sides, then add about a cup of cream and a tablespoon or two of tomato paste per pound of meat. (It helps to mix those two together first.) Simmer until your instant-read thermometer hits 165°F. Sprinkle with fresh herbs and more parmesan. Let the good times roll. Crack open a beer for this one. But don’t drink (much of) it. Brown sausages in a non-stick skillet over medium-high heat. Reduce heat to medium, and carefully pour (what’s left of) that beer into the pan. Simmer, turning the brats occasionally, until the beer is gone for real. If you started with uncooked brats, check for an IT of 165°F before serving. If they need more time, add a little water to the pan and simmer on, while you grab your own beer. 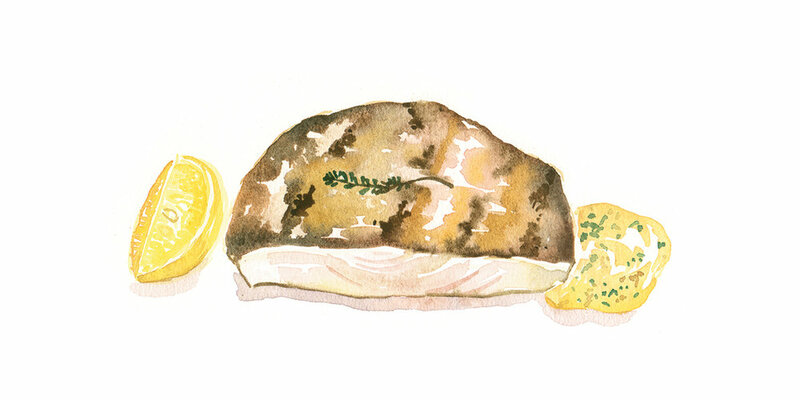 A fish you can cook like a steak. What a relief! Just season with salt and pepper, and slap it on the grill over medium heat (or you can use the broiler, but be warned, steak-like qualities aside, it does still smell like fish when you cook it). Flip once, after about 5 minutes. Cook until your instant-read thermometer reads 145°F. (Them’s the USDA rules. If you like it rare, do your own thing.) Serve with our simple tartar sauce and a wedge of lemon. Or just melt some butter on it—like a steak, right? Fish with a mayo crust. It’s a bit of kitchen magic that means you don’t need breading. Use whatever fish fillets you like: cod, haddock, halibut, tilapia. 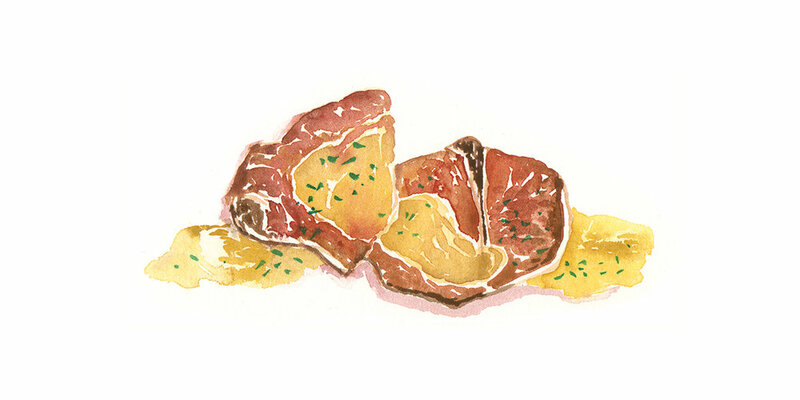 Arrange on a buttered baking dish, spread with mayo, sprinkle with a squeeze of citrus—lime, lemon, even grapefruit. Bake until the fish is just cooked (145°F on your handy-dandy instant-read thermometer, or less if you like it rare) and the mayo browns and forms a crust. If you don’t care for mayo, try thin slices of butter instead. If you do like mayo, don’t forget the tartar sauce.